The Oppo Find 7 has been garnering a lot of news lately with a lot of rumors and speculations around it and now as the time of its release comes closer Oppo is giving out some of the juicy details about its newest beast. 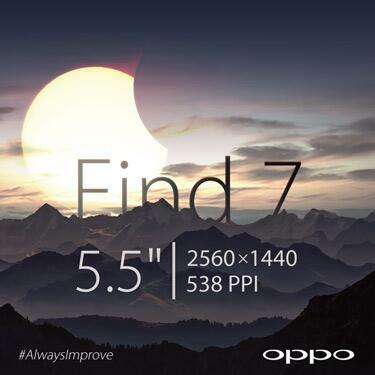 The Find 7 is the successor to the Oppo Find 5 and yes even we are confused on the increment of a couple of digits. 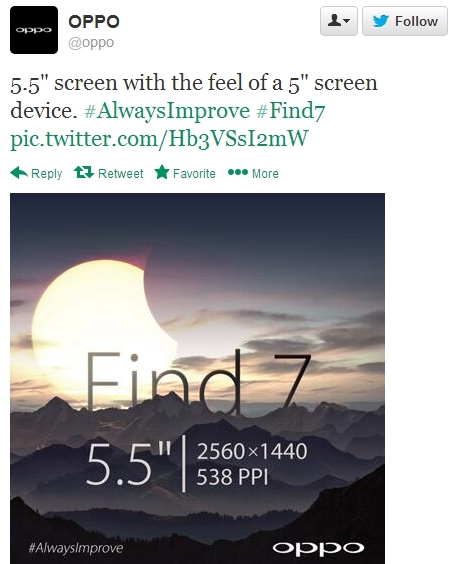 In case you were thinking the Find 7 will feature a 7-inch display as the name suggests then let me correct you as Oppo has just revealed from its Twitter account that the Find 7 will come with a 5.5-inch display with 2K (1440×2560) resolution making it one of the first if not the first device to feature the latest pixel dense displays. They also claim that the device will give you a feel of 5-inch display smartphone which means we can expect ultra thin bezels to make that 5.5-inch display fit in a compact form. Hold on as the 2K display is not the only spec that will wow you. Reportedly, the Find 7 will come with the latest and greatest Snapdragon 805 processor. There should be 3 gigs of RAM, a 13 MP camera and a 4000 mAh battery (Thats the amount of battery capacity my old Sony laptop came with). Right now all the other specs have not been officially confirmed so we’ll let you know when every detail of the Find 7 gets official. Till then we can sit back and imagine how crisp and impressive that display will be. Well i’d love to see one in real.